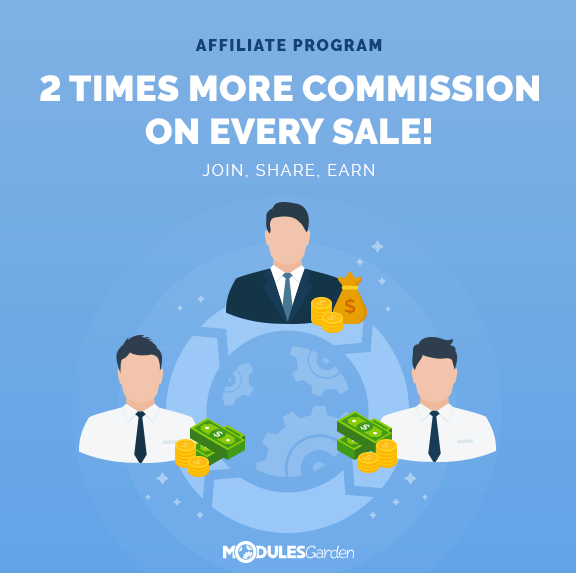 Increase Your Affiliate Commission Twofold! Are you a veteran well-seasoned in our Affiliate Program already? Or perhaps you are just toying with the idea of becoming an excellent Internet marketer alongside ModulesGarden? Either way, the one-of-a-kind promotion we have launched with a view to lifting your affiliate earnings will certainly spur you into immediate action! As part of our spectacular deal, all Affiliates who generate the sale on the level of at least 10 orders before the close of May will earn twice as much commission for every single finalized product purchase! If this unprecedented range of opportunities offered to you by our rare bargain is not enough, we are euphoric to pamper all freshly joined Affiliates with an extra welcome gift. Sounds like something worth exploring? Apply to our Affiliate Program today and we will let you in on every gripping detail! Oh, and no need to worry about any additional expenses. We do not collect any entry fees for the membership in our Affiliate Program. Partnering with us is both entertaining and free! Looks great, we’ll sign up and see if our resellers will be interested.